Reliable, affordable, secure on-site paper shredding cost. First question may be, what is a box? We are referring to a bankers box, basically it is the size of a standard file drawer. If you have them in other boxes or bags, no biggie, we’ll just estimate how many boxes it would be. A kitchen bag holds about the same as a box. 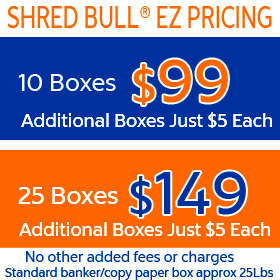 We charge $15 per box for shredding less than 10 boxes. If you do have 4 or more boxes we will gladly come to your home or business. 3 or less, give us a call and we will make an appointment for you to come by our RSM office. We are also open on Saturday mornings for drop in shredding, just drop by Saturday morning 8AM-Noon. Drop in shredding on Saturday does not have any minimums. If you come to us for shredding, it is done at our Rancho Santa Margarita Office. This is important–we shred the documents while you are here…you watch as we shred! Have 10+ boxes to shred? Shredding costs less if you have more than 10 boxes to shred. It’s only $10 each box if you have at least 10 boxes of paper to shred. Our mobile paper shredding company performs our document destruction at your site. More Than 20 Boxes, Nice! If you have more than 20 boxes to be shredded we will come to you and shred all the paper onsite. Believe it or not, our price drops for all boxes over 20 to just $8 bucks, 30 is only $7.00 each, and 100+ boxes will cost just $5.00 ea. It drops down the more boxes you have. Add a dollar per flight of stairs, per box that we have to carry up or down. Example: 100 boxes down 3 flight of stairs would be $300.00 stair charge. Pricing is not the only consideration you have, but let’s face it, once you watch a big mobile shredding truck shred your documents you’ll understand how difficult/impossible it would be for anyone to put all those pieces of shredded paper back together. Our truck holds 10 tons of shredded material…that would make for a huge puzzle. Once we shred your documents, they never leave our control…ensuring a proper chain of custody. We are 100% compliant with all privacy legislation as well. Bottom line is, we are small and efficient allowing us to beat the big guys prices. Looking for how much shredding costs for weekly/monthly business scheduled services? Here is our shredding services pricing, call us if you have any questions. Shred Bull Paper Shredding Truck arrives at your home, business or you come to our RSM office. Documents are shredded immediately, while you watch. This is important, some places don’t shred on the spot, which is un-safe. Client can receive a certificate of destruction with their invoice. By the box shredding costs the same if we come to you or you come to us. You can call us or text us anytime. If we are not at the office we still answer the phone, respond to questions and set up appointments, 7 days a week. We service accounts in the field Monday-Friday 7:00AM- 6:00PM and are open for no appointment shredding Saturdays 8:00AM – Noon . Does shredding cost more if we come to your home? Nope, you just need to have more than three boxes and we’ll send the truck out. We service accounts in the field Monday-Friday 7:00AM- 6:00PM and are open on Saturday and Sunday by appointment.